ขนาดของจี้ : ประมาณ 9x30 มม. 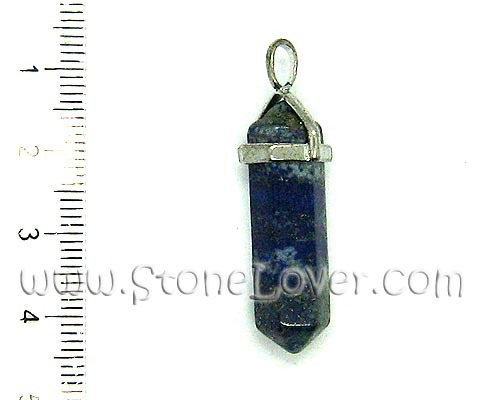 Size of Pendant : approx.9x30 mm. Healing Properties : This stone is a deep blue sapphire with gold dust inside. it is a composite of several materials with sparkling flecks of pyrite, or fool’s gold, adding to its mystical allure. Attributed with great healing, purifying and curative properties, Lapis Lazuli allegedly points the way to enlightenment, and aids in the opening of the Third Eye. Popular with ancient alchemists (who knew it as sapphirus), it was used in medicine, cosmetics and paintings. It was also believed to confer ability, success, divine favor, ancient wisdom and cure sore throats. No wonder it was as valuable as gold. The stone is said to increase psychic abilities. Lapis is said to be a cure for melancholy and for certain types of fever. Lapis lazuli eliminates negative emotions. It relieves sore throat pain. Traditionally believed to increase mental clarity, virility, and calm. Lapis Lazuli is energy focuser for teachers, lecturers and speakers. Enhances creative self-expression. It is believed to be useful in relieving depression and promoting spirituality. Lapis Lazuli is also powerful during meditation. It's a symbol of powerful stone. It strengthens wisdom, knowledge power, open mind and eye to see the fact. This stone has a great protection power, remit irritated eye.